Providing as safe an environment as possible in our gardens and allotments. Whenever possible a small corner should be left as a wildlife sanctuary, the rewards of which could include the pleasure of seeing visiting hedgehogs, as well as the knowledge that they will be helping in clearing the ground of pests. Accumulating materials – garden rubbish, leaves, brushwood, etc. – suitable for hedgehogs nests (hibernacula) and supplementing their natural diet of slugs, snails, beetles, worms, caterpillars and suchlike with some protein (e.g. meat based pet food, minced meat or crunchy hedgehog/cat biscuits), particularly in periods of unseasonable weather. A bowl of drinking water should also be available at several sites around the garden. Caring for baby hedgehogs – as described in the “Know Your Hedgehog” leaflet “Caring for Hoglets”. Assisting them to avoid man-made hazards and eliminating or reducing such dangers whenever possible. 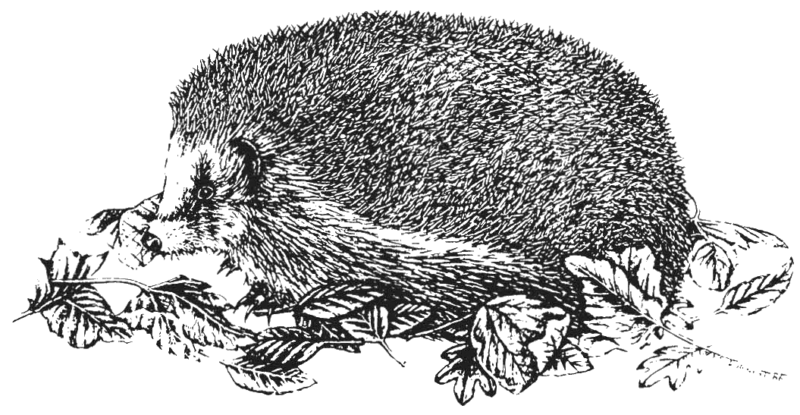 Most of us see more squashed hedgehogs than live ones. Their natural defence mechanism – rolling into a ball – is no protection against ROAD TRAFFIC. All nature-loving people want to do something about this carnage. So, do drive carefully, especially at night, do all you can to avoid hedgehogs that may be crossing the road and if it is safe to do so stop and assist hedgehogs to get across quickly. Ask your friends to be kind to hedgehogs on our roads too. Hedgehogs and many other small animals, as well as birds, frequently cannot escape from the sheer-sided pits beneath cattle and sheep GRIDS. This results in a long drawn out death by dehydration and/or starvation. A simple ramp in the grid solves this problem – for further details see the “Know your Hedgehog” leaflet “Ramps”. Many PESTICIDES are potentially dangerous to hedgehogs and SLUG PELLETS are no exception. 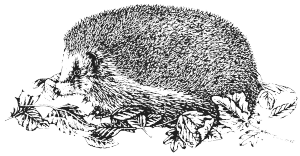 Hedgehogs may eat the pellets, and they are very likely to eat the poisoned slugs and snails. We advise you to use GARDEN CHEMICALS sparingly and, if you must use slug pellets, put them inside pieces of pipe or under stones where hedgehogs can’t get at them. We believe, however, that alternatives to chemicals can work very well, for example copper bands and tape are available to place round the base of plants or pots. “Beer-traps” (i.e. a bowl of stale beer or milk sunk in the ground) can be an effective way of killing slugs. In any case, as an extra precaution, all dead slugs should be regularly removed. Some people have reported success at protecting plants by sprinkling coffee grounds round the base (coffee shops will often let you have these for free). Any form of pest control affects the hedgehogs’ food chain, but barrier products like the copper and coffee grounds mentioned above means the slug or snail remains healthy and safe for the hedgehog to eat. GARDEN RUBBISH frequently provides a home for hedgehogs and should be carefully turned over before burning. It is safer to make your bonfire on the day it is to be lit or to use a garden incinerator specifically designed for burning rubbish. The larger heaps that accumulate for 5th NOVEMBER, of course, should always be checked prior to the BONFIRE NIGHT FESTIVITIES and preferably resited on the day. GRASS, especially if a little longer than usual, is another possible home for hedgehog families and care is needed before MOWING and STRIMMING. Cut the grass to a more reasonable length and then check again for hedgehogs and other wildlife. Never burn pampass grass without first checking there are no hedgehogs using it as a nesting place. Hedgehogs can swim and are sometimes attracted to GARDEN PONDS, but they may drown if they cannot get out. 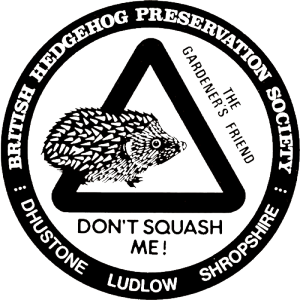 Gardeners should ensure that there are slipways around the edge of the water to enable the hedgehogs to escape – half submerged rocks or even a piece of chicken wire to be used like a scrambling net are suggested. Pond levels should be kept topped up. NETTING of all kinds – that used for covering plants and fruit, as well as tennis nets, fishing nets and suchlike – can be a major hazard as hedgehogs easily become entangled in them. Their inquisitiveness can also get them into trouble if their heads stick in various kinds of CONTAINERS – empty food cans, yoghurt cups, plastic mugs, fast food ice cream cups, etc. 4 & 6 PACKS – The plastic rings that hold cans together are dangerous because wildlife can get trapped in them. Always make sure each circle is cut. What better reasons could there be for always picking up our litter? Hedgehogs are sometimes subjected to DELIBERATE CRUELTY by heartless or thoughtless people. This is now illegal. Should you see this occurring contact the police or RSPCA. If the unfortunate hedgehog is injured, try to get it to a Veterinary Surgeon, or local hedgehog carer, and report the matter to the local RSPCA. In any case, please let the British Hedgehog Preservation Society know about it. a) To encourage and give advice to the public concerning the care of hedgehogs particularly when injured, sick, treated cruelly, orphaned or in any other danger. b) To encourage children to respect our natural wild-life – by supplying information and giving lectures, and thus fostering an interest in hedgehogs. c) To fund research into behavioural habits of hedgehogs and to ascertain the best methods of assisting their survival.